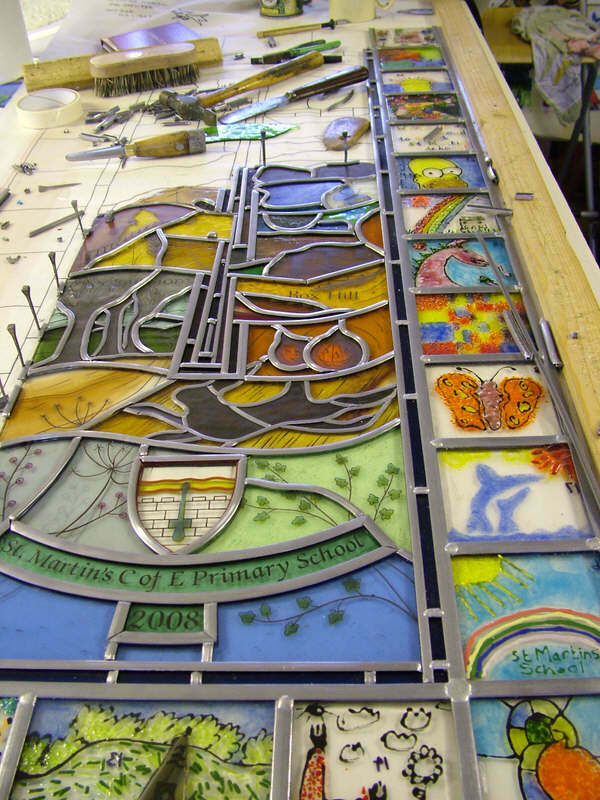 In the summer of 2007 I finished making a new stained glass window for St Martins C of E School in Dorking, Surrey. As a parent of two girls, one at the school, the other a recent leaver, I had a desire to create a long lasting gift for the school. Magnificent help from the members of the PTA in fund raising ensured that the materials would be paid for with kind donations from local businesses. The centre of the stained glass window is made in the traditional way using cutting, painting and firing to produce the detail. It depicts the houses of the school through the seasons. Ranmore in winter, Box Hill in Autumn, Bury Hill in summer and Leith Hill in spring. On this journey we also see some local flora and fauna, harvest mice cling to ears of corn, a bee orchid grows upwards on the left and we see Roman snails, a feature of walks in the Surrey Hills and spotted by many a local child. The cross is woven into the design of the stained glass implying the way in which the Christian faith is woven into the lives of the children at St Martins. 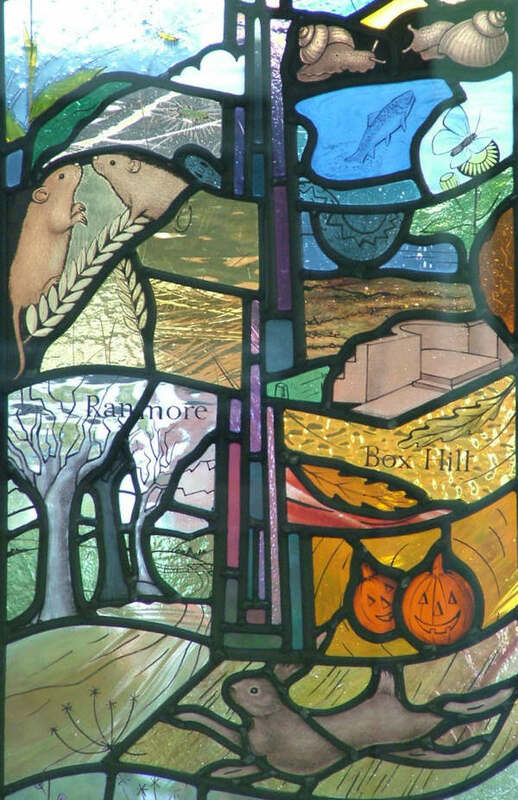 The inscription at the top of the stained glass is the schools vision statement, ‘Inspiring children to be the best they can be’. This reflects the very positive, nurturing and learning environment provided by St Martins C of E Primary School. 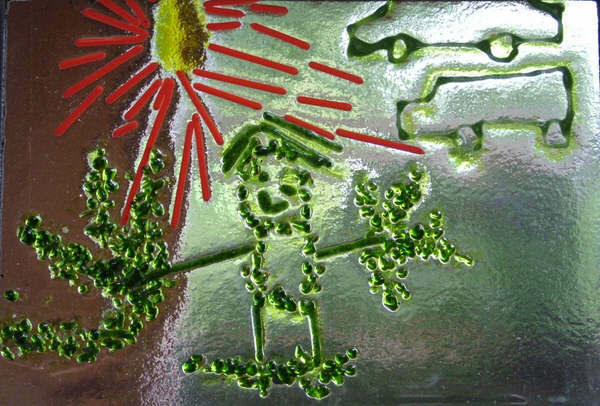 The wonderful border was created with glass fusing techniques. The children were asked to provide pictures of anything that inspired them. To draw or paint something they loved. These were then faithfully and painstakingly reproduced in fused glass by Mannon Lloyd, another parent and artist working with me at Abinger Stained Glass. I then leaded the stained glass window together and cemented it in the traditional way .The stained glass was left to sit for 3 weeks to allow the cement between the leads to dry before we encapsulated it into a unit of toughened glass.